any pictorial on the history of Seoul would contain a black-and-white photo of Seoul Train Station and City Hall, as it is a testament to all those who lived through it, or more so : survived it . it started operation in 1900 and during the Japanese occupation built in red bricks similar to another historical Tokyo Station in Japan . (this original single-story is currently closed, and open for art school graduate’s exhibition only in the Summer) then extended in 1947 and a modern glass structure built next to it, South in 2003 to signal a belated KTX bullet-train era . 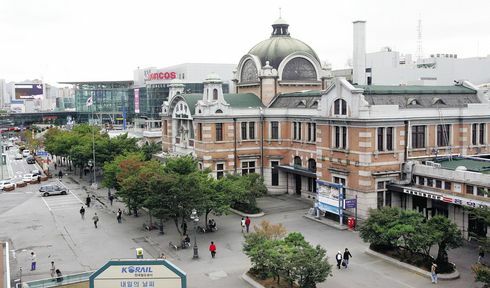 KTX operates 2 lines in Korea and this Seoul Station serves the Eastern half while YongSan Station (below) serves the West, thus the two main KTX stations are NOT connected by the same KTX line (in the beginning it was). this complex is connected underground via Subway Line 1 Seoul Station Exit 1 of AND Subway Line 4 Seoul Station Exit 14 .
for matters of avoiding confusion, although they are right next to each other in proximity : you should distinguish between “Seoul-Yeok” the old Train Station which is now defunct, and “KTX Seoul-Yeok” which is the modern KTX Station, and “Seoul-JiHaCheol-Yeok” which means the subway station of the same name . The rear-entrance or SeoBu Yeok is the only entrance at its West-side, with KTX Express courrier office on ground floor and Airport Express several level under-ground . North-East Entrance links into SEOUL Subway 1 and 4 Stations under-ground . South-East Entrance considered its Main Entrance, where in front is Lotteria Hamburger, taxi stop and bus stops, including out-of-city lines to satellite cities of SeongNam and BunDang . this Seoul KTX Station does not really form a monolith shopping complex formed from mixture of several department stores, malls and independent stores, but merely a rather simple Concos department store and a Lotte (super) Mart branch connected North, to the now-refurbished SEOUL Station, and mentioned here more for its symbol, although the whole structure put together is immense – (appended Summer 2014) mainly due to shopping structures added on top of Lotte Mart . connected directly to the ticketing area is CONCOS Galleria Department Store, a subdued version of the prestigious Galleria chain known for their heralding of haute-couture brands French and Italian . further linked by exterior passage is a super mart version of the well-known Lotte Department Store . although super marts are widely accessed in other cities, there are few within Capital limits for not much real estate ground left, and Japanese tourist flock to this place for their daily consumption of dried seaweeds after shopping at SEOUL’s classic shopping district of MyeongDong nearby .